A question we often get asked is, “How is the iBeat smartwatch different from the Apple Watch or a Fitbit?” Don’t they all monitor heart rate? The short answer is yes, they do all monitor heart rate, but how frequently they measure heart rate and other vitals, and what they do with these vitals is what matters. Here’s the longer (and more important) answer. The iBeat Watch is not a fitness tracker…it is a life tracker. Unlike traditional smartwatches, the iBeat Watch will not tell you how many laps you ran this morning, or alert you of a meeting on your calendar. It won’t notify you when you’re getting a phone call or text message, and it doesn’t want to be your personal assistant. The iBeat Watch was made specifically for heart monitoring…it goes beyond basic heart rate tracking and tracks a handful of other vitals. It then analyzes this data in real-time and looks for potential life-threatening emergencies such as the heart slowing or stopping, blood flow blockages, and sudden cardiac arrest. The Apple Watch and Fitbit are really great at what they were designed to do which is track the number of steps walked in a day and monitor heart rate during exercise. What they aren’t good at is continuous monitoring and tracking other factors related to a heart-related vitals like blood flow, tissue oxygenation, pulse strength, skin pressure, temperature, and activity levels. That’s where iBeat comes in. This watch is designed specifically to notify the user and his or her loved ones of a life-threatening cardiac event. Because our sensors track multiple biometrics beyond heart rate, we can achieve a high level of accuracy in predicting potential incidents requiring medical aid. What this has allowed us to do is build sensing algorithms that constantly monitor your heart to pay attention for any thresholds that appear to be unsafe – such as an overly erratic heart rate in rest mode or an extremely low pulse and oxygen levels while sleeping. 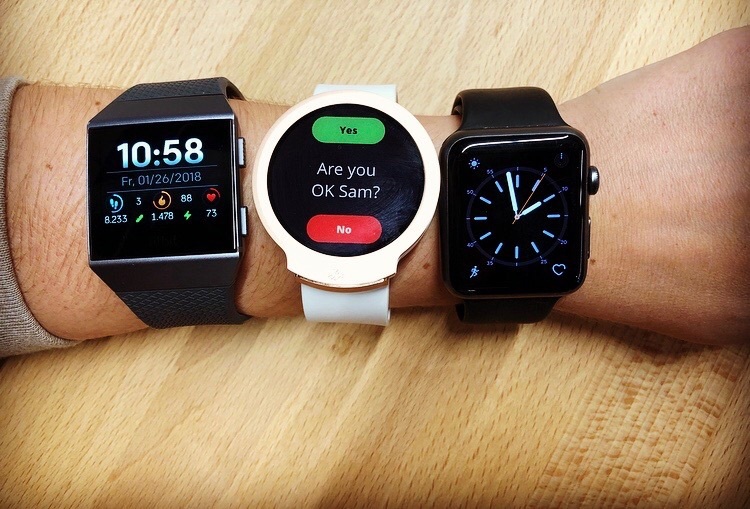 This is what differentiates us from being a basic smartwatch and elevates us to a smartwatch that can save your life. When comparing us to the Apple Watch, the Apple Watch only monitors your heart rate every 15 minutes, which is reasonable if there’s no need to worry about a cardiac event. But for users who are older, have heart disease, or an existing heart condition, the Apple Watch only sees a potentially unsafe event if it happens to take place in the short timespan the heart rate is actually being monitored. Any other time, you’re out of luck. The Fitbit, on the other hand, can continuously monitor heart rate, but that is all it monitors. Additionally, if you want to get the 4+ day battery life Fitbit boasts, you must turn off the continuous monitoring feature, and the Fitbit becomes more like the Apple Watch – monitoring only dozens of times a day. iBeat though, continuously monitors multiple vitals – and dozens of times a second – so you don’t have to worry about your heart-related risks. Instead, the watch makes monitoring your risk easy and convenient. Let’s talk batteries. The Apple Watch is notorious for not making it a full day on one charge. Users have to make sure to charge the watch nightly while they sleep so it’s ready to go the next day. The Fitbit has a much better battery design, and users can expect to get roughly four days out of it, but only when the continuous sensing feature is turned off. The iBeat smartwatch was designed to consume less battery and last five days on a single charge – all while still continuously monitoring your heart rate and other vitals. Plus, it can be charged while being worn, something other wearables are not capable of. This means you never have to take the watch off, leaving you worry-free should of something happening while charging your device. PERS devices are often big and bulky and come equipped with a button for users (mostly the elderly) to push if they fall or are in some kind of distress. Often they’re worn around the neck or on a belt. When the button is pushed, a call goes out to a local emergency response team and help is on its way. 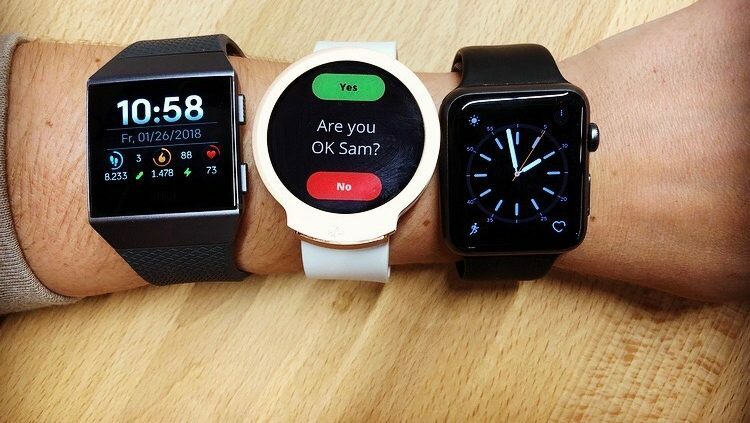 We consider the iBeat Watch to be more closely aligned to a PERS device. After all, it’s providing you with personal safety and can dispatch immediate emergency help. Like most PERS devices and even the Apple Watch, the iBeat Watch does also have a help button. By holding down the button for two seconds, the iBeat Watch will begin the emergency flow. It will ask on screen who you need help from – your ‘Contacts’ or ‘911’. If ‘Contacts’ is selected, you will see a list of all your contacts and can choose to notify ‘All Contacts’ or select individual ones. If 911 is selected, our 24-hour response team is notified as well as your contacts. Our response team will then dispatch local emergency responders to your exact location. They will also be able to update your emergency contacts with your status and where you were taken – urgent care, a hospital, etc. While that Apple Watch does have an SOS button, it handles emergencies differently. When pressed, it makes a direct call to your local 911 meaning you need to be conscious and able to share what the emergency is, your location, and who to notify. If you’re in the middle of a cardiac event or have fallen and are unconscious, you or someone else will need to manually press the button and call for help. With iBeat, passive emergencies and user-triggered emergencies are both covered. For heart-related emergencies and falls that leave you unconscious or unresponsive, iBeat senses these distresses (even if you don’t know it) and will automatically make the call for you. For other emergencies such as break-ins, assaults, or getting lost, you can press the button and get the right kind of help whether it’s from the police, firefighters, paramedics, or even just a loved one. Have more questions? Click on our Live Chat button below, or shoot us an email at support@ibeat.com.